These have been on my 'to-make' list for awhile. 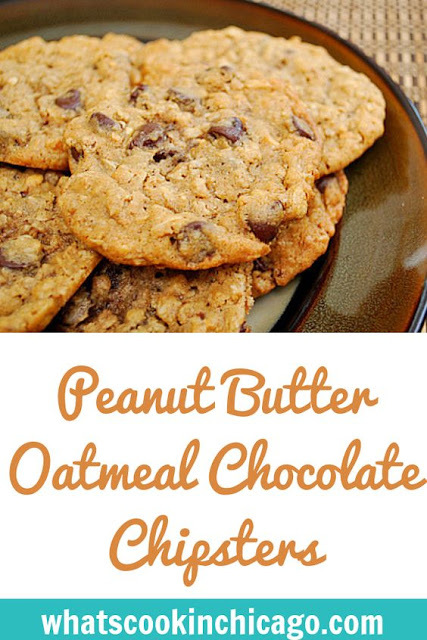 It took me so long to make these because my husband isn't a fan of peanut butter (the horror!) and I normally don't have peanut butter in my pantry. When I had a craving for peanut butter, I picked some up and wow... I realized how much I missed peanut butter! I guess I'll have to keep a jar on hand going forward even if it means I'll be the only one eating and using it! These cookies are amazing. They have the perfect balance of the three cookie flavors all wrapped into one. 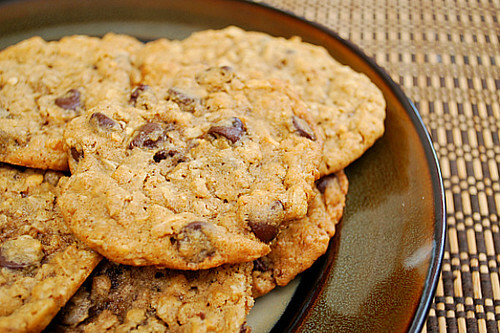 The crunchy oatmeal and hint of cinnamon and nutmeg highlight oatmeal cookies... the nutty aroma and bits of chopped peanut (from using extra crunchy peanut butter) highlight peanut butter cookies... and the subtle butterscotch notes and chocolate chips scattered in the mix highlight chocolate chip cookies. This cookie couldn't be any more perfect! Position the racks to divide the oven into thirds and preheat the oven to 350 degrees F. Line two baking sheets with parchment. Whisk together the oats, flour, baking soda, spices and salt. Once dough is chilled, scoop up rounded tablespoons, roll the balls between your palms and place them 2 inches apart on the sheets. Press the chilled balls gently with the heel of your hand until they are about 1/2 inch thick. Bake for 13 to 15 minutes, rotating the sheets from top to bottom and front to back after 7 minutes. The cookies should be golden and just firm around the edges. Lift the cookies onto cooling racks with a wide metal spatula - they'll firm as they cool. Repeat with the remaining dough, cooling the baking sheets between batches. Oh my goodness, I'm drooling!! These look fantastic, thanks for sharing!